The Heavy Photon Search (HPS) is an experiment proposed to the PAC37 in January 2011 at Jefferson Laboratory. The experiment will search for new heavy vector boson(s), aka “heavy photons” or “dark photons” or “hidden sector photons”. 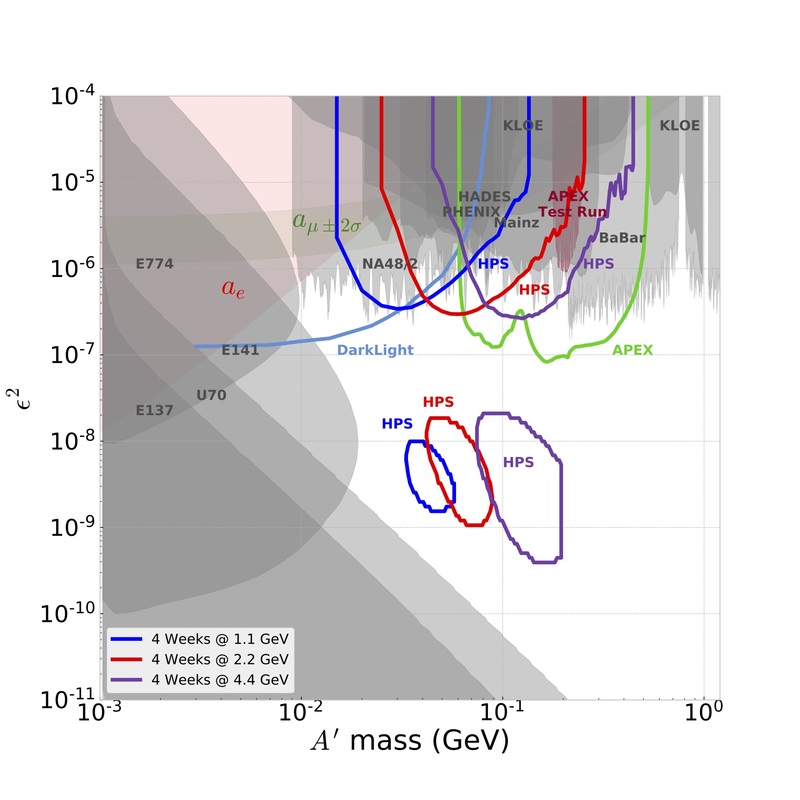 It is now well established that visible matter (stars, gas, dust etc) makes up only a very small amount of the total mass of our universe and the rest is “dark matter” and “dark energy“, and it is well recognized that an explanation of these phenomena will require some kind of extension of the Standard Model. Many such extensions require one or more new U(1) symmetries, which would be carried by a new heavy photon. Such a heavy photon would kinematically mix with the ordinary photon and thus interact very weakly with ordinary matter. The HPS is sensitive to heavy photons in the mass range of 20 MeV/c2 to 1000 MeV/c2. Heavy photons mix with the ordinary photon through kinetic mixing, which induces their weak coupling to electrons, εe, where ε~10-3. Heavy photons in this mass/coupling range are expected on very general theoretical grounds, and motivated by recent astrophysical evidence suggesting they might mediate dark matter annihilations and/or interactions with ordinary matter. Since they couple to electrons, heavy photons are radiated in electron scattering and can subsequently decay into narrow +e– resonances, which can be observed above the copious QED trident background. For suitably small couplings, heavy photons travel detectable distances before decaying, providing a second signature. The HPS experiment exploits both these signatures to search for heavy photons over a wide range of couplings, ε2 > 10-10, and masses, using a new compact, large acceptance forward spectrometer, silicon microstrip vertex tracker, PbWO4 electromagnetic calorimeter, and muon system. An estimate of the “reach” of the experiment, the expected sensitivity versus the coupling and mass, is shown in the figure. This plot also shows the existing limits from other experiments (grey shaded areas), and a few of the limits from proposed competitor experiments. This plot has changed significantly since the experiment’s proposal, as other experiments have joined the search for heavy photons and as we learned more of the details of the HPS apparatus. The experiment will be positioned behind the CLAS12 detector in Hall B at Jefferson Lab, and run with 200 – 500 nA beam at 1 to 6.6 GeV on 0.15% – 0.25% X0 tungsten targets. The experiment achieves great sensitivity by exploiting CEBAF’s 100% duty cycle, high luminosities, and 40 MHz continuous readout. With 3-month runs at each incident energy, HPS will explore a large and unexplored domain in the mass/coupling plane with extraordinary sensitivity, enough to exclude or see a heavy photon signal conclusively. As a bonus, HPS should make the first observation of “true muonium”, the μ+μ– “atom” which decays like a heavy photon and has ~ cm decay length. A great amount of detail about HPS can be found in the experimental proposal (pdf) and the public wiki pages. The HPS experiment has a short article in Nature News: “Physicists hunt for dark forces”. Popular Science: “While the LHC Hunts Higgs, the Jefferson Accelerator Looks to Illuminate Mysterious ‘Dark Photons’.